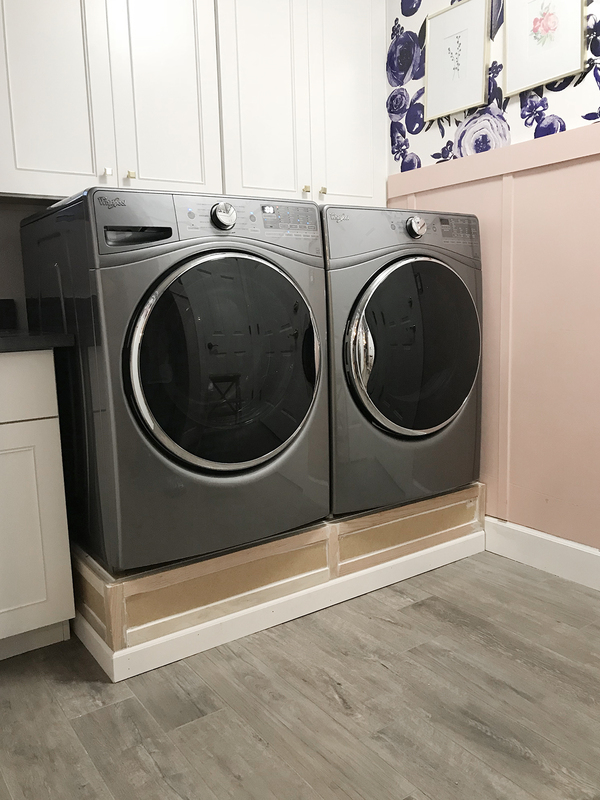 This is a project we’ve wanted to tackle since we got our new washer and dryer a couple months ago. I absolutely love front load machines but having them a bit higher is super convenient. You know what’s not convenient? Pedestals that cost 1 million dollars. Some of them are SO expensive! 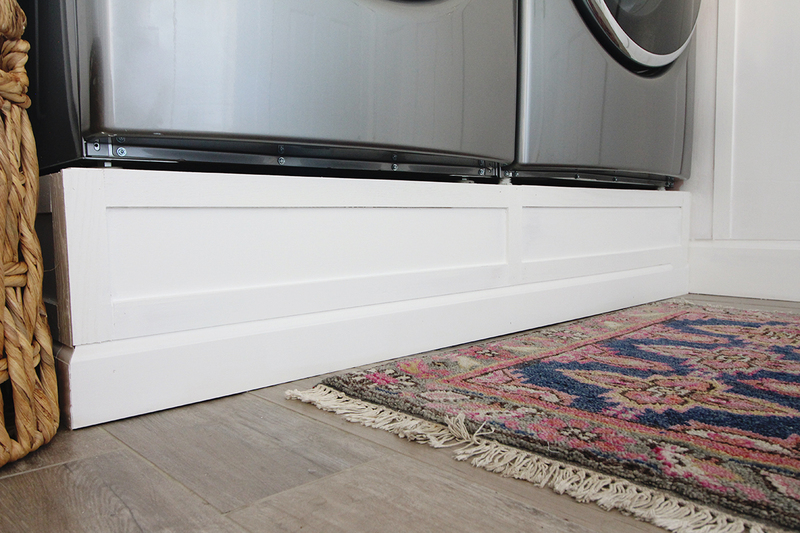 We knew we could DIY some for a fraction of the cost and get a more custom “built in” look. Just a heads up, everyone’s measurements are going to be a bit different. 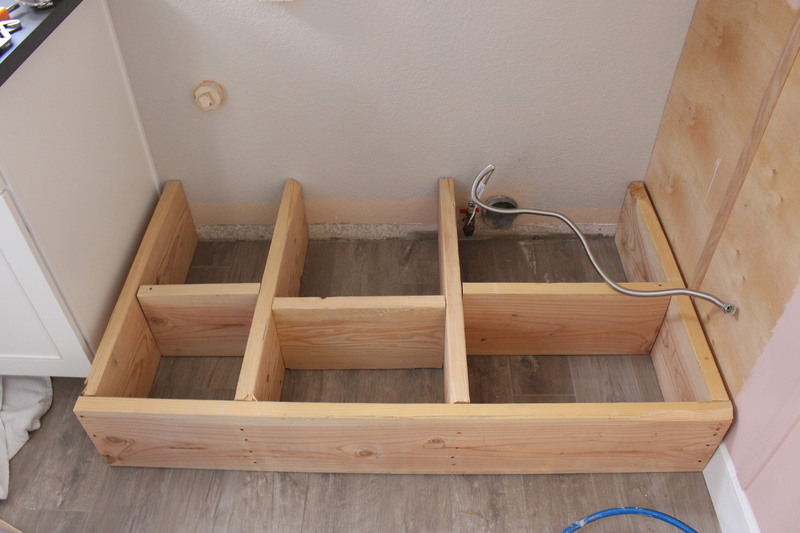 We’ve built these before and it definitely needs to be customized to your own space. That being said, I can’t give you exact measurements and a cut list for your wood. 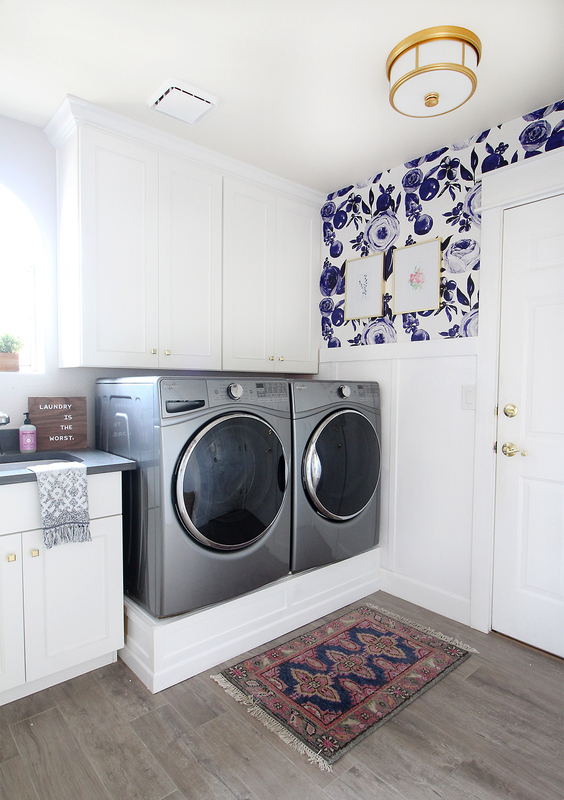 First, remove your washer and dryer so you can carefully examine how much space you acutally have. Measuring from wall to wall, wall to cabinet, etc. 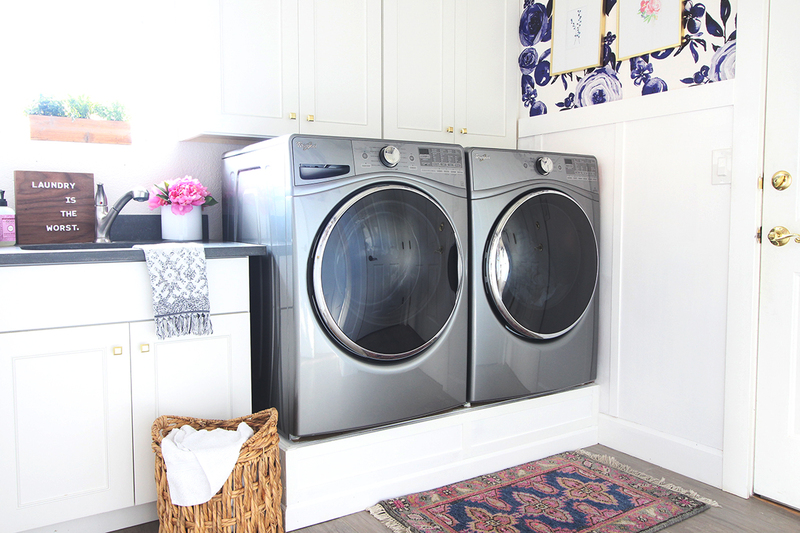 is not very accurate because there are other factors, like your dryer vent, outlets, etc. you’ll want to consider. You’ll use 2x10s on the 2″ sides for your frame. 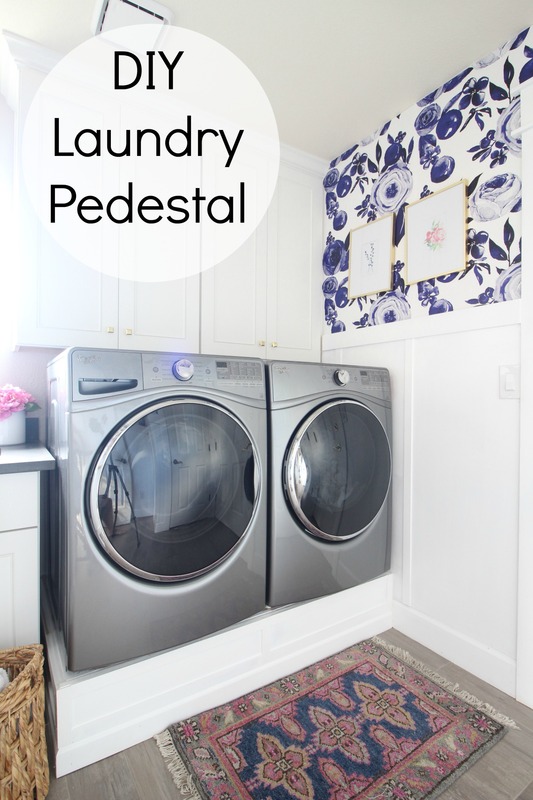 This makes your pedestal about 10-11″ tall after all is said and done. First, we made a “U” shape by putting the longest piece across the front and two side pieces on each side. I *think* the long piece was about 57″ and our sides were about 36″ (?). Since I have a broken foot, my hubby did the cutting on the saw and I forgot the exact measurements but yours will likely be different. Next, we used two more (the same length as the “side” pieces to act as center supports. So, 4 vertical pieces. We used a pneumatic nailer to nail them all into place. Next, we measured the gaps (these are not spaced perfectly because no one will see the supports and no one has time for that *wink*) and then we cut 3 (horizontal) supports and nailed them into place. These are staggered so we can get our nailer in there to nail in each board. 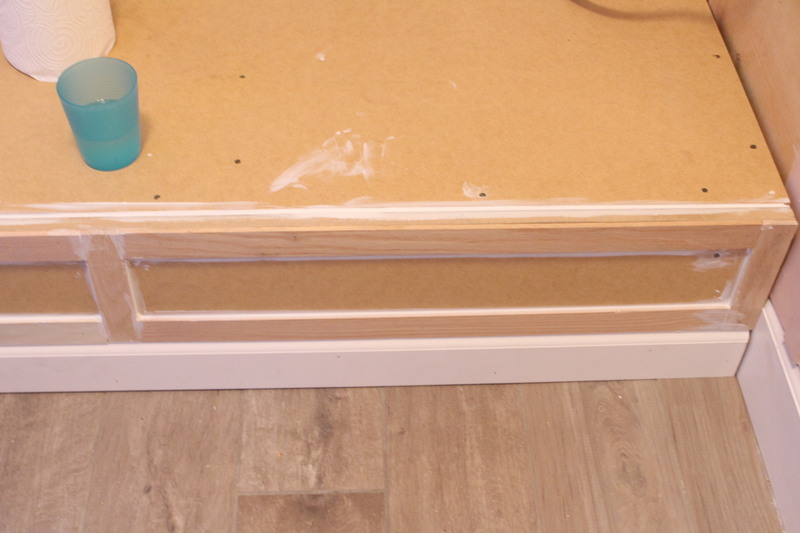 Next we measured our front piece, top (deck) piece and any exposed sides (you could only see one of our sides) and had Home Depot cut 1/2″ MDF to those sizes for us. 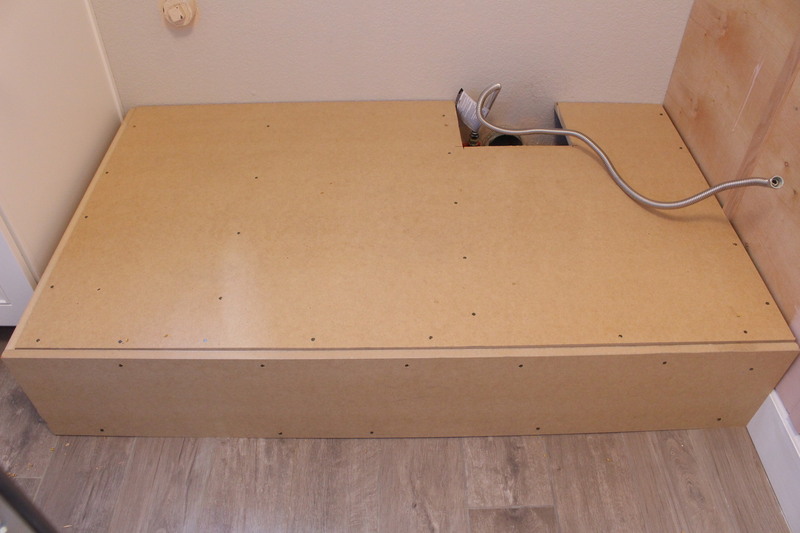 We notched out a spot for the dryer vent and nailed the MDF into place. Next, you can get creative. 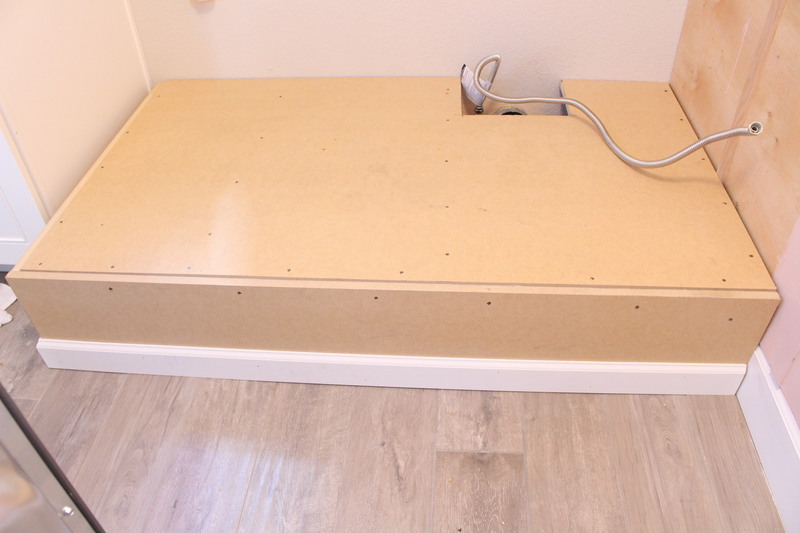 I used a baseboard and trimmed out the base of the pedestal and then used 1.5″ lattice trim to trim little boxes on the front and exposed side. 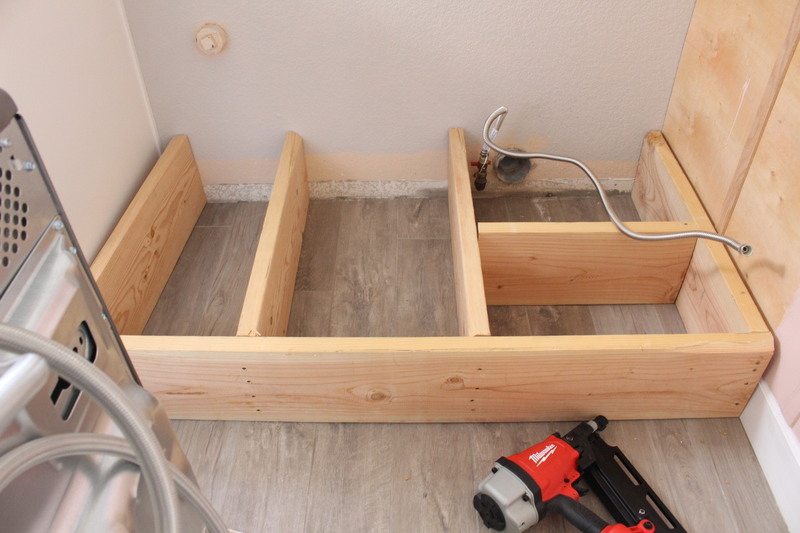 This gave it a custom look and covered the nail holes from nailing the MDF onto the frame. Finally, we caulked and painted the entire piece with Behr Ultra Pure White in Semi-Gloss. This is the paint we used for doors and trim throughout our house and I wanted it to match. You could totally do a fun color if you want! That’s IT! It was super simple and honestly, going to Home Depot getting the wood cut was the most time consuming part. We did the whole thing in a couple hours on a Saturday and I LOVE how it turned out! Now this pregnant mama (with a broken foot!) can reach the front loaders SO much easier!